File contains several pages of notes on the settlement and medical professionals in the Bay of Quinte area. File contains a c.1965 program for the “Spring Thaw” sponsored by the Belleville Canadian Mental Health Association. File contains a newspaper clip on Mrs. Jay Campbell and her report of the Belleville nurses register. File contains a newspaper clip on a new polio immunization program for adults c.1958. File contains doctors bills for Belleville area doctors from c.1920-21, and three Christmas cards from Dr. Robertson to patients. Daybook of druggist containing a record of purchases from 1845-1846. File contains newspaper clippings of advertisements, and original invoices from various druggists throughout Belleville c. 1926-64. Druggists include L.W. Yeomans, McKeowns, Ponton, Duff's Drugs, and McKeowns Seldon's. File contains a c.1901 letter to Col. Ponton, c.1968 newspaper clips on the women who owned and ran the original and first Belleville General Hospital, and clips on the Belleville General Hospital needing expansion. File contains a c.1915 newspaper clipping on the Belleville General Hospital being forced to take on soldiers with meningitis, according to military rule. File contains newspaper clips on a c.1969 W. Hoop auxiliary meeting, and a c.1962 clip on the W. Hoop Auxiliary annual meeting at Belleville General Hospital. 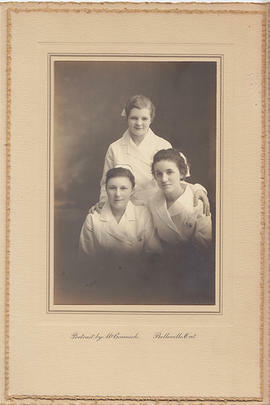 File contains a c.1847 invitation to the graduating exercises of the learning school of nurses graduating class, and a c.1955 program for the School of Nursing graduation ceremony. File contains a c.1890 program for an opera house benefit presenting “Temple of Fire” to raise funds for the Belleville General Hospital, and organized by the Women's Christian Association.